This woman is something of a sensation and she is making a brief New Zealand visit - Auckland June 8-9, Wellington 10-11. 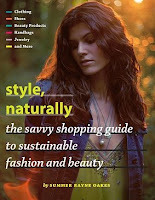 Showcasing hundreds of eco-friendly designers and sustainable products, Style, Naturally is the ultimate source book for fashion, beauty and eco conscious consumers. In this lavishly illustrated and beautifully designed book Summer Rayne Oakes, fashion model, and resident expert on Treehugger.com and Discovery Network's Planet Green, explains the basics (from fair trade to organically grown), and showcases hundreds of designers and eco-friendly brands. Stella McCartney, Safia Minney’s People Tree, Levi's, Noir, Loomstate, Dr. Hauschka, and Aveda – all of these brands have made earth-friendly materials and sustainable practices a priority. With over 500 photos, pages of resources, tips of the trade, personal vignettes, designer profiles, and girl-on-the-street style profiles from the hottest trendsetters, it is the go-to fashion and beauty bible for women who want to feel good about looking good. From rainforests to runways, Summer Rayne Oakes, (pic left by Annouk Morgan), – an environmental scientist, entomologist, and model—is spreading the word about how fashion and beauty really fits into today’s world. Arguably one of the most energetic voices in the environmental movement, her unique career combines her passionate activism and image with her environmental expertise. A Cornell University graduate and Udall environmental scholar, Summer Rayne has taken environmental advocacy to the next level by trailblazing a career in values-based modeling--or exclusively aligning her work with more environmentally- and socially-conscious designers, companies and programs—a career which has garnered her the name of World’s First Eco-Model (Grist Magazine,Vanity Fair).